Clay roofing has been around for practically forever. It was first brought to America in the 17th century by European settlers, and the trend stuck due to its durability and fire resistance. Clay roofing really took hold after major fires in New York and Boston in the 1660’s. Fire codes were created that encouraged fire-proof clay tile roofing. Their durability, ease of maintenance and low thermal conductivity simply sealed the deal, making it one of the most popular roofing materials for nearly two centuries. Clay tiles have one of the longest life expectancies of any roof covering, if properly installed and maintained. Some clay roofing has been known to last over 100 years. 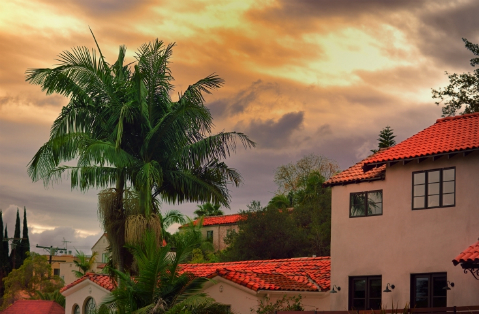 Clay tile roofing and its lookalikes has remained a strong aesthetic style in the US, especially Florida and California. There are two types of fastening systems for clay tile roofing – interlocking and overlapping. Interlocking clay tiles essentially hook onto each other, while overlapping must be nailed into place as they do not have a “lip” for attachment. The two main styles of clay tiles are “pantile” and “flat”. Pantile clay tiles are rounded or convex in shape. Flat clay tiles can be entirely flat like shingles, and others have a bit of shape. Both styles can come be interlocking or overlapping. Pantile clay roofing is much lighter than flat, and can be laid at a lower pitch. There are many varieties of clay tile roofing, and often the same name will refer to different tiles depending on your location. For example, Spanish or “S” tiles common in the Southern United States are called Single Roman tiles in England. Not much as changed in regards to methods of attaching clay tiles to a roof. The main exception is that today wood sheathing and roofing felt is almost always used. The method of attachment varies depending on the size and shape of the clay tiles being used. Generally, clay tiles are attached with nails, or by hanging them on “nibs” attached to the wooden sheathing. At the latter half of the 19th century, it became common to substitute concrete for clay tile roofing. Although concrete tiles do not retain the same color or quality as clay tile roofing, they continue to be used as a viable cheaper and lighter alternative. Today it is common to see “ clay roofing ” made of various aggregates, and even metal roofing can mimic the classic look. Clay roofing is not suitable for a DIY project. Despite its durability, clay tile roofing is very delicate and can easily break if walked upon. If properly installed, clay roofing can last decades. The main problem with clay tile roofing is usually improper fastening. If you wish to invest in this beautiful old style of roofing, it is worthwhile to seek out the best clay roofing contractor in your area.